Linda's piece was so beautiful and haunting that I wanted to make sure the EVPs worked into it with a natural, non-challenging feel. So I opened up her piece a bit and added some extra depth to widen the composition up a bit to absorb the natural harshness of the EVPs. I also added some of the phrases in reverse to the overall composition to create an eerie uneasiness without losing that original ethereal appeal. I then carefully chose and placed the EVPs in a way to enhance the overall harmonic rhythm of the work. Some of the EVPs were repeated so the observer might be able to glean some of the actual utterances contained in them. All the years I've spent in University Libraries I have always felt somehow never quite alone. (I actually fell asleep on the catwalks of the University of Notre Dame's Law Library once and spent the night with some disturbing nightmares!) So with all of the enlightened learning and such that goes on in those quiet and venerable places, I wondered if there wouldn't be some interesting attraction to our post - coil energy that might ebb there. And through my work, I found that the voices are clear, sometimes worried and insightful. Michael Esposito is an experimental artist and researcher in Electronic Voice Phenomena. EVP is the occasional tendency for voices to mysteriously end up on more or less quiet recordings, when there is no logical reason for them to be there. 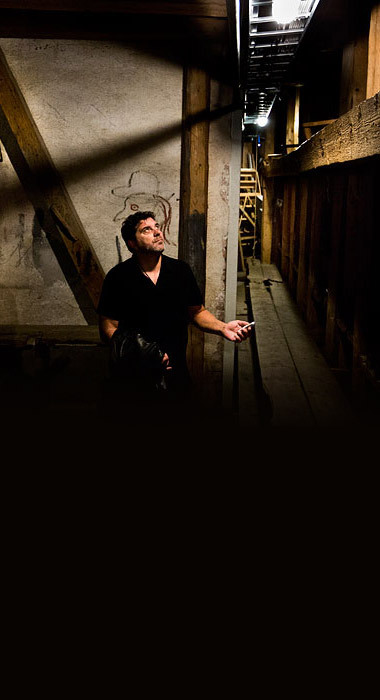 Not simply a ghost hunter, Esposito works extensively with EVP's relationship to experimental music, combining EVP with field recording and related frequency tones of research sites, incorporating these sounds into compositions either alone or with other well regarded collaborators. He was a Psy-ops officer in the gulf war, and studied communication theory at at Purdue University, University of Notre Dame, American University in Cairo, Egypt and Governor's State University. Michael is currently published by Touch Music, UK.